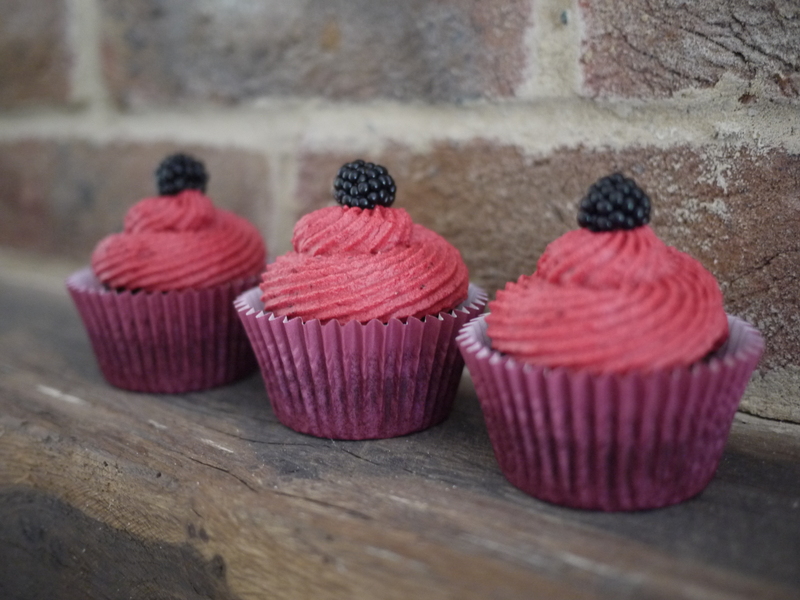 It must be time for another blackberry recipe! I haven’t baked any cupcakes for a while, so thought I would make some seasonal ones. I made some chocolate cherry ones a few months ago and liked the idea of combining dark chocolate with the fruit. 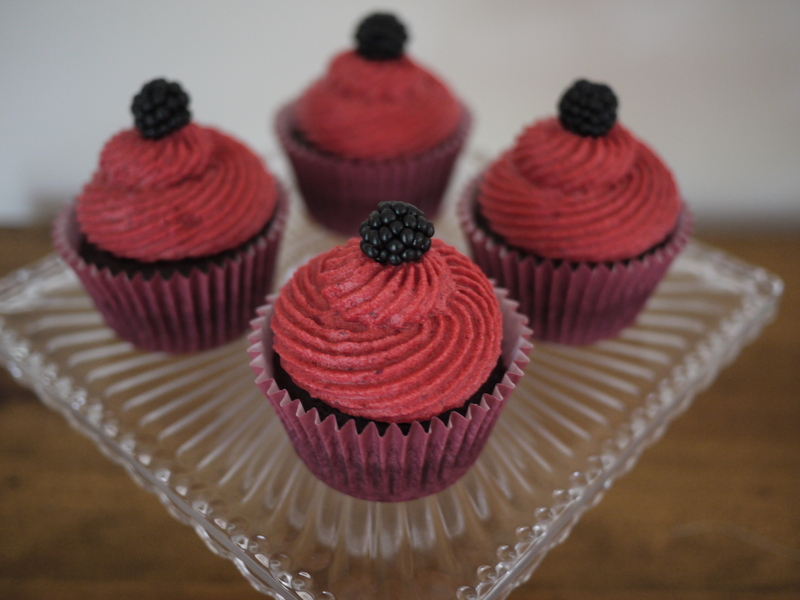 I also love the colour from the blackberries so added a blackberry puree to the buttercream, to give a pretty pinky purple colour. 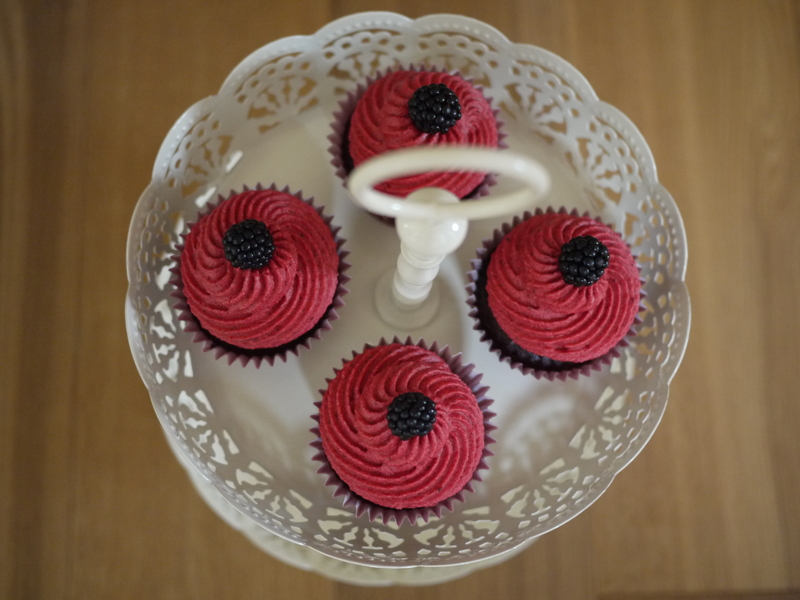 I also used the left over blackberry and white chocolate ganache to put in the middle of the cupcakes – delicious! You could always make these without the ganache filling, I just had some left over, so thought it would be a nice surprise when you bite into them. Heat oven to 160C fan/gas 4 and line a 12-hole muffin tin with paper cases. Crush half the blackberries with a fork so the juice comes out but there are still some blackberry chunks. Put the butter and chocolate into a small saucepan and gently melt. Mix the flour, sugar, cocoa powder and a pinch of salt in a large mixing bowl. Scrape the butter-chocolate mixture and eggs into the dry ingredients with the crushed blackberries and 100ml boiling water. Mix together until smooth. Divide between the cases and bake for 15-20 mins until risen and a skewer poked into the centre comes out clean. Remove from the tin onto a wire rack and cool completely. Now make the buttercream. Using the remaining 150g blackberries, whizz to a purée. Beat the icing sugar and butter together on a very slow speed until the mixture resembles coarse breadcrumbs. I always put a tea towel over the top of my mixer to prevent icing sugar going everywhere! Then slowly add the blackberry puree and vanilla. Once it’s all been added increase the speed and beat on high for 5 minutes until light and fluffy. 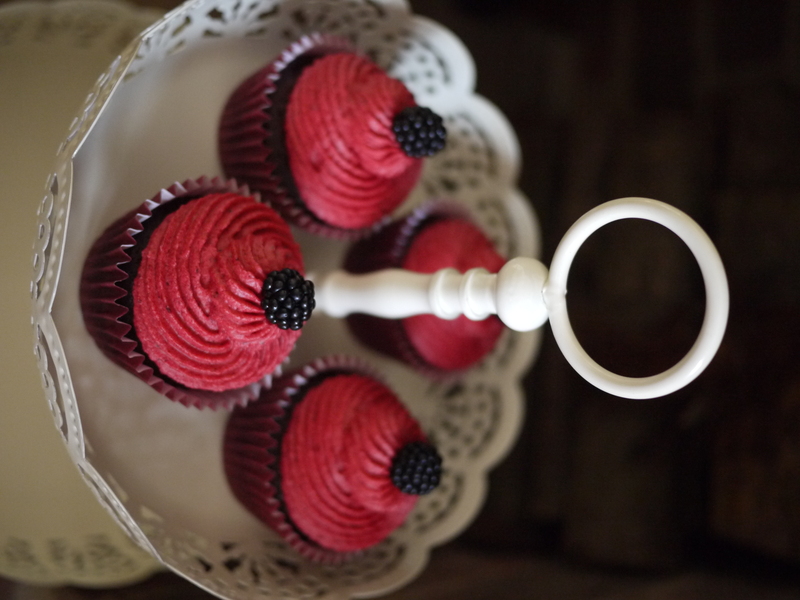 I used a cupcake corer to take a small piece of cake out of each cupcake, added a tsp of the white chocolate and blackberry ganache and then replaced the small piece of cake on top. The join will be covered when the buttercream is pipped on top. 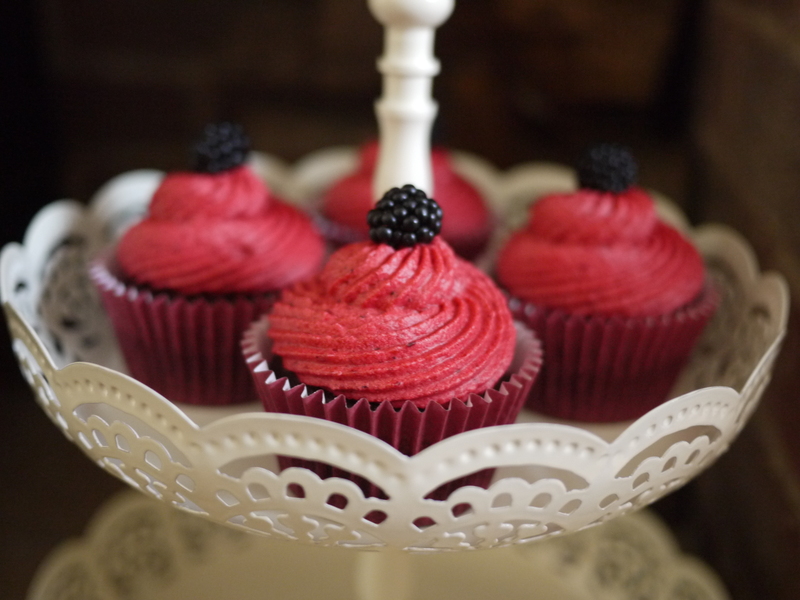 Pipe the buttercream onto the cupcakes and top with a blackberry. The buttercream was very soft, but the colour was amazing. Sometimes the simplest decorations are the best!